Physical perfection isn't just a desire. It's the law. The land is called Calabiyau, and it's the heart of an other-dimensional world called Eventyde - the origin and home of all Faery beings and creatures. Calabiyau is the source of all magic, and was created by thirteen "Perfects" in 26,080 BT. (Before Time). Calabiyau Proper - The largest of the Kingdoms. Home to the Biyau dynasty (Kandide's linage) and the Keepers of the Gift, the spell that enables all life to survive. Calabiyau Proper consists of twelve clans, and is governed by a monarch, as well as an elected High Council consisting of one member from each clan. The Biyau family has maintained its monarchy since the year 1 BT, when they united the clans and closed Calabiyau to outsiders. The Banshee Kingdom - The Banshee Clan spit off to form its own Kingdom when gold and precious gems were discovered in the high mountains to the north. Notoriously ruthless, the Banshees are predominantly a matriarchal society. Though it has had had many kings, far more of their rulers have been queens. Their desire to control all of Calabiyau remains unquenched. Read more about the Banshees below in the Clan section. The Bardic Kingdom - Home to Wizards and Bards, it is where Merlin spent his remaining years, after the Fairy Viviane locked him in the sacred tree. Contrary to common belief, she did not do it to imprison him, but to save his life. Merlin lived at the Bardic Temple for another 200 years. He also fathered several children. Kandide's great, great, great Grandmother, Queen Nada, had a child by Merlin. King Toeyad, Teren, Tara, and Kandide are all of his blood. The Kingdom in the Mists - This secretive Kingdom was founded by Kandide's father, King Toeyad, to provide a safe haven for Imperfects. It lies within a dead-land of gnarled and tangled trees called the Mists. A democratic Kingdom, it is led by Selena, (Kandide's aunt) and Jake (son of Lord and Lady Socrat.) Both Selena and Jake are Imperfects. The Kingdom has a large Chateau and seven villages. It is also home to the last few remaining Griffins in the world. The Forbidden Land - The home to rare and nearly extinct creatures such as Flying Turtles, Centacors - Deer whose horns can emit fire; Albino Fire Birds; Woolly Crocotta - an amber and black-colored dog-like creature; Spotted Owl-Cats - with the face and wings of an owl and the body of a lynx; along with other mystical and more normal creatures. A 500-year old majestic white lion named Netapa oversees this forbidden land. Only the Rulers from the four kingdoms are allowed to visit, and only once a year. There are twelve Primary Fée Clans. (The Banshee Clan is the thirteenth, but no longer part of Calabiyau Proper. ) Each of the twelve Primary Clans is made up of many Sub-Clans. For example: the Earthern Clan includes Sub-Clans for rocks, soil, sand, gems, metals, and a litany of other elements related to the earth. Banshees consider themselves to be the thirteenth Clan, and quite separate from all other Fée. They also consist of Sub-Clans. Each Sub-Clan consists of a multitude of Guardian Clans. For Gems this includes: Guardians of diamonds, emeralds, rubies, quartz, topaz, and all other precious and semi-precious stones. Fée who are of mixed heritage, i.e. their parents are from differing Clans such as Kandide’s father and mother (Aquatica and Bontanica) select which one they want to align with. Clans are often an indication of a Fée’s magic Talents, but not always, since so many Fée are of mixed heritage. Tara, for example, chose to align with her mother’s Botanica Clan, and yet her main Talent is as healer. Tara also has the ability to revive withered plants, as well make them bloom, even in the dead of winter. Many magic and spell-weaving Talents can be transferred and/or learned. As with any skill-set, some Fée are more adept at certain types of magic and spells than others. Teren has exceptional Talent in virtually every form of magic and spell-weaving except healing. 1. Earthen Clan – Lord Aron (His sub-clan is that of Soil and he is the Guardian of Fertile Lands. Lord Aron also has the ability to communicate with the creatures that live in the ground.) Various members of Earthen Clan are able to cause earthquakes, trigger landslides, and/or create sinkholes. Others have the power to move extremely large rocks, and can use their talents to quarry the granite and marble used in construction. And still others can find and unearth precious gems and minerals. Ley lines, the electromagnetic fields within the earth’s surface, are the source of power for the Earthen Clan. Drawing upon that energy is how they achieve their amazing feats. 2. Aquatica Clan – Lady Corale (Her sub-clan oversees the Oceans & Seas and she is the Guardian of Tides. She can create massive waves, or the calmest of seas. She can also communicate with the animals that live in the oceans.) Some members of the Aquatica Clan can create rain, ice, and/or snow, or cause rivers to instantly change course, and waterfalls to run uphill. Kandide is a member of the Water Clan, as was her Father, King Toeyad, and his father before him. 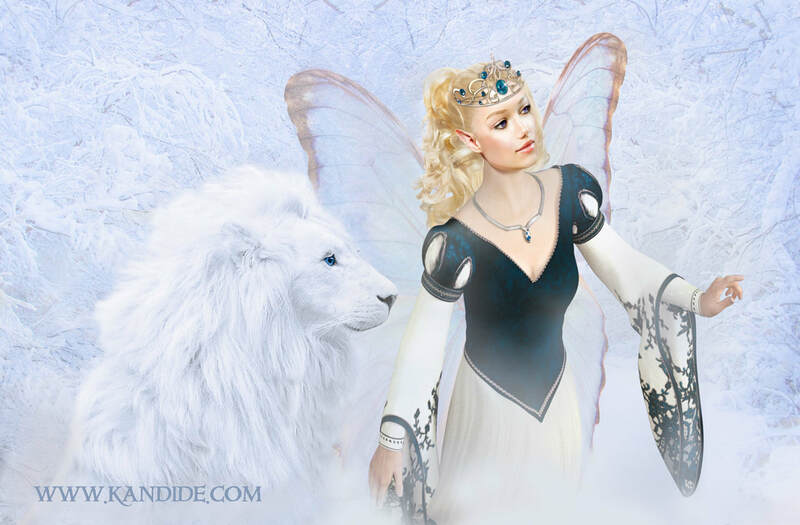 Kandide’s unique Talent is the ability to change the upper atmospheric conditions to trigger the first Frost—required for the survival of all life. She is the only one who can do this, and like her father before her, will eventually pass the Gift of the Frost on to the next in line for the throne. 3. Fire Clan – Lady Aron (Her sub-clan is Volcanic and she is the Guardian of Molten Lava.) Members of the Fire clan can control fire and heat—be it above the earth or inside its inner crust. Flames do not affect their bodies. They can walk into a blazing inferno without being harmed. They can also generate tremendous amounts of heat and light, create explosions, melt rocks, trigger volcanic eruptions, and draw heat from the center of the earth, or pull lightening from the sky. Pure-blooded Fire Fée have wings of flames. 4. Atmospherica Clan – Lord Standish (His sub-clan is Wind and he is the Guardian of Breeze) The Atmospherica Clan controls the wind, from gentle breezes to torrential cyclones. Various members of the Air Clan can conjure spells that can instantly change the atmospheric conditions from perfectly still to a powerful tornado. Others can use their Talents to create intricate crop circles, while still others can conjure up toxic gasses or create water by fusing Carbon Dioxide and Oxygen molecules. The most talented ones can also manipulate global air currents such as the jet stream that encircles the globe, or create vast dust storms. 5. Botanica Clan – Lady Socrat (Her sub-clan is Forest and she is the Guardian of Trees. As such she controls the magic that emanates from the sacred Elm, Ash, and Oak trees. It was, after all, this magic that the Fairy Vivian used to entomb Merlin.) The Plant Clan’s special Talents are responsible for seeds sprouting, flowers blooming, and the growth of the entire food chain for all Fée. They can also manipulate branches and vines causing them to appear life-like. King Toeyad utilized their amazing powers in reverse, to sustain the dead-lands that surround the Château in the Mists. Most Fée from the Plant Clan have a green cast to their skin. Members frequently become herbalists, and are extraordinary gardeners and/or farmers. 6. Animalize Clan – Lady Alicia (Her sub-clan is Reptiles and she is the Guardian of Snakes) Animalize Clan members are responsible for the welfare of all animals, and can directly communicate with them. Many can shape shift into the particular species that they are the guardians of. Lady Alicia has often slithered away when she is angry during a particularly argumentative High Council meeting. Ancient Fée legends tell that werewolves are half Fée, half human descendants of the Animal Clan. Members are frequently adept at Glamour spells. The Banshee Crown Princess Cyndara’s mother was of the Animal Clan, which is where she gets her Talent. 7. Wisdom Clan – Lord Socrat (His sub-clan is Knowledge and he is the Guardian of Philosophy.) As the name implies, Wisdom Clan members are the wisest of all Fée. They are the keeper of spells and magic. Many have wizard blood, and are powerful magicians. Merlin is said to have had Wisdom Clan blood in his veins. They are often the spiritual leaders of the Fée. Some of Calabiyau’s greatest military generals are of the Wisdom Clan, as they are also great strategists. General Mintz is of the Wisdom Clan. His father was also a great military leader. 9. Creativity Clan – Lady Batony (Her sub-clan is Music and she is Guardian of Song) The Creativity Clan is the keeper of all things creative—poetry, art, architecture, and music, etc. Individuals are born musicians, painters, sculptures, actors, writers, designers, comedians, and singers. It is said that music played by certain members of the Creativity Clan can lure humans and Fée, alike, into trances where they are completely under the control of the perpetrator. Sirens—those beings who are half bird or fish and half-human—are long-ago decedents of the Creativity Clan. 10. Scientifica Clan – Lord Revên (His sub-clan is Math and he is the Guardian of Geometry) Scientifica Clan members are the inventors, mathematicians, and teachers. Most of the advances in spell-divination and magic originate from the Science Clan. Transporting is just one example. A relatively recent discovery, transporting was developed by Lord Revên’s great grandfather a mere 300 years ago, as the Fée measure time. Scrying—the ability to see from afar via a mirror or still water—was also invented by the Science Clan and is a Talent many possess. To the Fée, the difference between science and magic is that science is still unfolding; magic always works. 11. Healing Arts Clan – Lord Salitar (His sub-clan is Research and he is the Guardian of Ointments, having invented many healing potions and tonics.) Not every member of the Healing Clan can use his or her hands to heal. But all have the innate knowledge of herbs to create healing ointments. Hand-healers such as Tara, Leanne, and Lars are considered to be the elite among this remarkable clan. Only one out of a hundred can do any form of hand-healing. Leanne and Tara are considered to be the most powerful of all. Tara’s Gift came from Selena who transferred it to her when her aunt was sent away to the live in the Chateau in the Mists. The irony of hand-healers is that they cannot heal themselves. They also can only heal injuries or wounds where the body has the potential rejuvenate itself. They cannot cause arms, legs, or wings to grow back. 12. Heart Clan – Lady Karena (Her sub-clan is Kindness and she is Guardian of Sharing) Of all the Clans, the Heart Clan is the most mysterious and illusive. Cupid, himself, was of the Heart Clan. His arrows, tipped with magic potions, caused many a Fée and human to fall hopelessly in love. They can weave love spells, as well as mend broken hearts. Or cause someone to vehemently dislike someone else. Being in a room with members of the Heart Clan is generally a calming experience, though not always. They can reverse their normally positive energy to create pandemonium and chaos. Many also have the Talent of Glamour—appearing to be someone they are not. And some can even read minds. The Heart Clan is especially adept at scrying. Often referred to as the “Shadow Clan,” Banshees have, through the ages, been thought by humans to be the bearers of death and destruction. Their reputation for being unrelentingly ruthless and militaristic has certainly reinforced this impression. Human legends, in general, tell only of female Banshees. And while there have been many more female Banshee rulers than male; indeed, they are both female and male. The Banshee Kingdom, which is mostly mountainous, is in the northwest part of Calabiyau. It consists of twelve districts called Allboroughs. They are organized by function and include: Mining, Farming, Political, Financial, Textiles, Masonry, Artisans, Music, Military, History, Math, and Science. Above all else, Banshees value gold and jewels. Many from the Mining and Artisan Allboroughs are the finest metal workers and gem smiths in all of Calabiyau. Because their wings are smaller than the Fée, they cannot fly great distances or for very long. They are, however, highly skilled archers and extremely competitive and war-like. Like the Fée, their magic and Talents vary according to which sub-clan they are from, and how pure their Clan-blood is.